Standing in the early twilight hours of the sunrise at the Gould Community Center I was thankful that I could join the other 285 runners at the starting line. My heart issues a few weeks prior cost me some valuable training time and had me wondering if I’d be able to race. 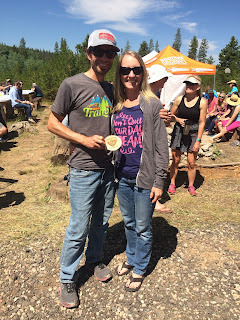 Once I got the green light from the cardiologist to run, I had five solid weekends to get some vert in and a small taper before the Never Summer 100K. It would have to be enough. 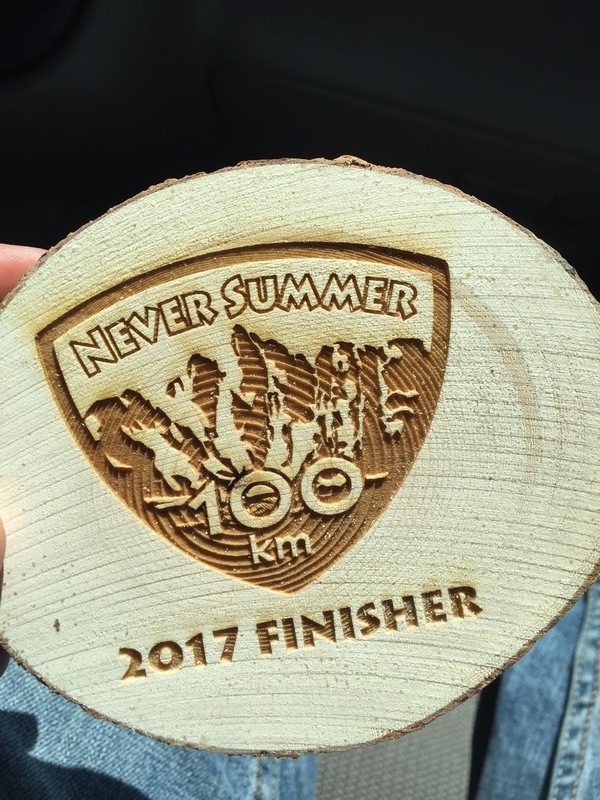 Never Summer 100K is a 65-mile race in State Forest State Park in Northern Colorado. 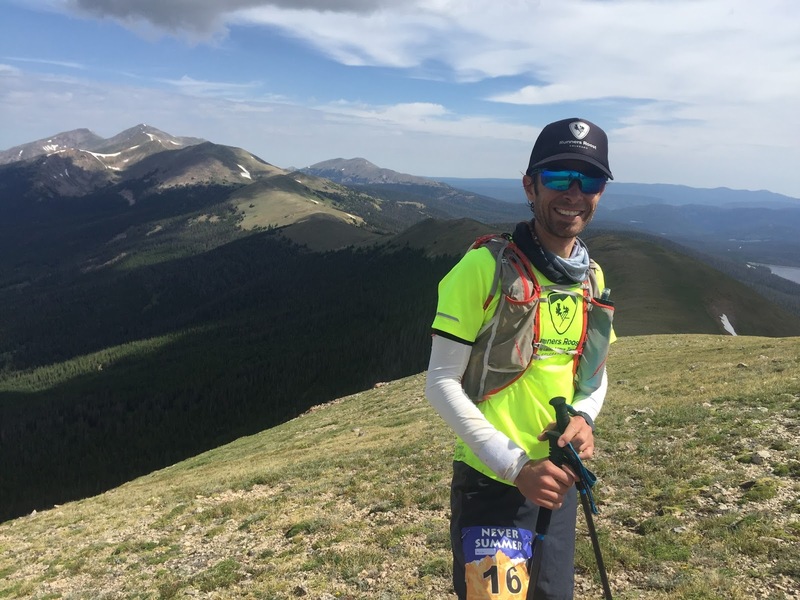 The course takes you through the Never Summer Mountains and skirts the southern edge of the Medicine Bow Mountain Range. 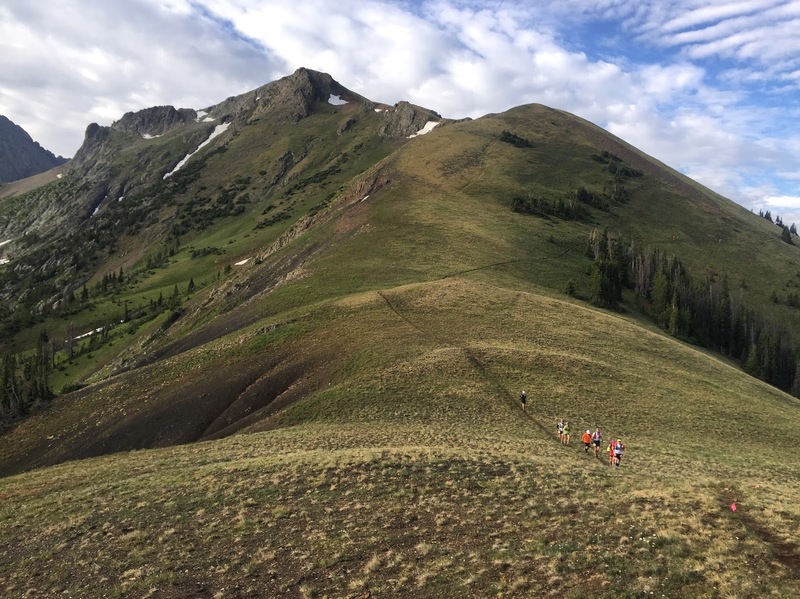 The race has over 13,000 feet of vertical gain and most of it takes place over 10,000 feet above sea level. Simply put, this was one of the hardest 100K races in the country. 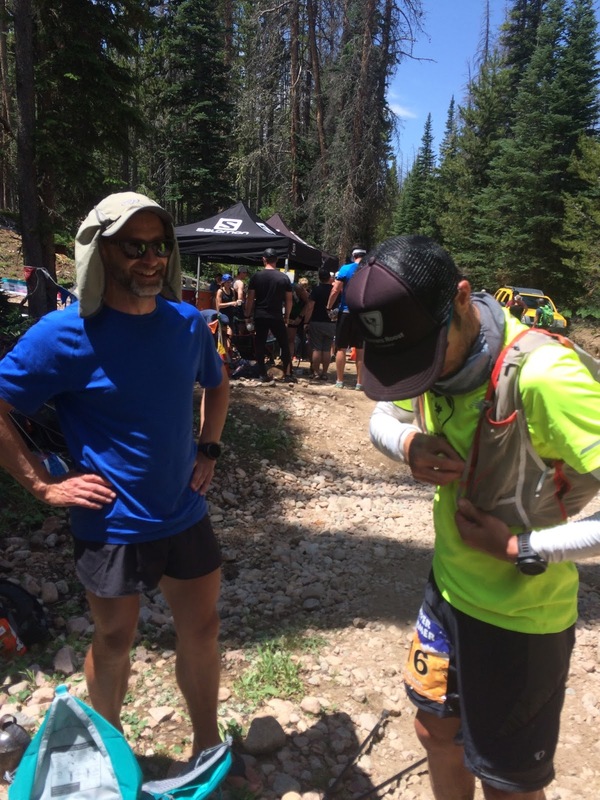 I was fortunate to be racing with several other athletes I knew well including my good friend and legendary ultrarunner Junko Kazukawa and fellow Runners Roost athlete Becki Lynn. Julie and I at the start. The race started at 5:30 AM and I hit the trail towards the back of the pack. 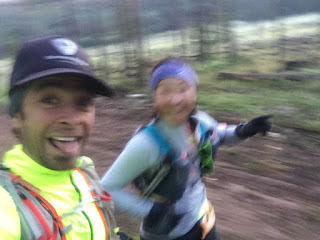 Junko and I ran together for the first couple of miles and chatted it up. The beginning of the race is fairly flat which was nice as a warm up. This would be the last flat section for a while! You could see the expanse of the mist covered valley below us and the rocky peaks towering like skyscrapers in front of us. 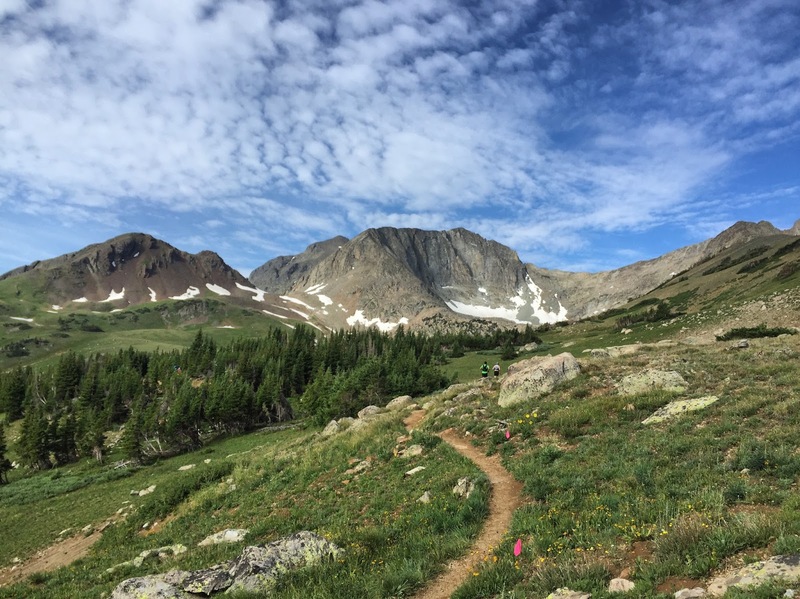 My breath fogged up the air in front of me as I began the first climb. 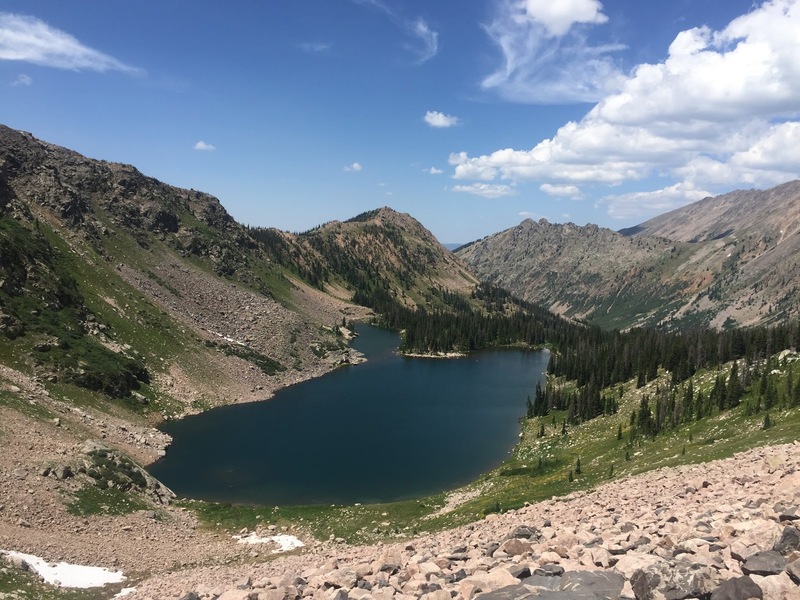 The first climb is about 2,000 feet over four miles and takes you up to the 7 Utes lakes. It isn’t overly steep, so I jogged where I could and power hiked the rest. It would be a long day so I chatted it up with some other runners along the way. One guy was running in a Santa suit and I asked him if I could call his reindeer later to help me out on the hills. 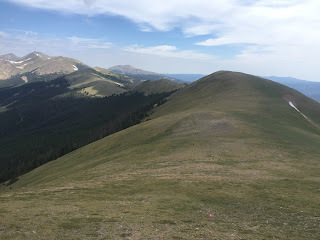 We then headed east over a rolling tundra mountain ridge marked my pink flags to show us the way. There was no trail to follow so we all ran towards the flags. 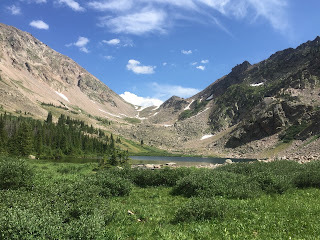 From there, we worked our way into another meadow with more mountain lakes and valleys. I took my phone out to take another photo and stubbed my toe and fell right into the stream. It took me off guard, but besides a bruised bum, I seemed to be okay. I was by myself and no one saw the fall. My pride was saved. I hurried up and got to my feet and started running again. 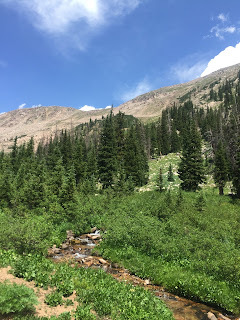 I crossed another stream and made my way onto a single track trail. 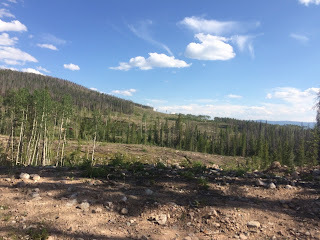 The trail was tiny and forested and I began to wonder if I was in the right place. I had not seen a pink flag in a while. I turned around, thinking I was lost, but soon after, another runner came blazing by me so I figured I was okay. We ran the trail for ½ mile or so until it came to a junction. There were no pink flags at the junction and we knew we were off trail. 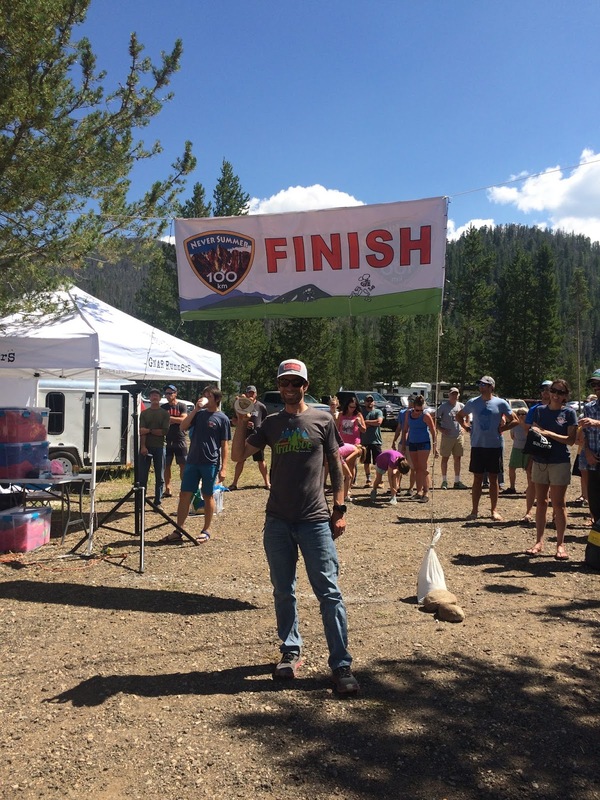 I’ve heard stories of people getting lost in races before, but it had never happened to me. The guy in front of me turned around as well and we started to run back to the river crossing. We heard some voices down the hill from us so we decided to bush-whack down to them. I slid down the hillside and joined the group of runners. There were about 8 of us that ran together and we figured as long as we were running north, we would eventually make it to the main trail. About ½ mile later, we found the main trail and I breathed a sigh of relief. This mistake cost me a little over a mile which amounts to about 15 minutes on the race. I refilled some water at the Michigan Ditch aid station at mile 11 and began to cruise down the hill to Mile 17 where I’d see Julie. Some of this trail was uber technical downhill with loose rock and scree so you had to be careful not to get hung up. 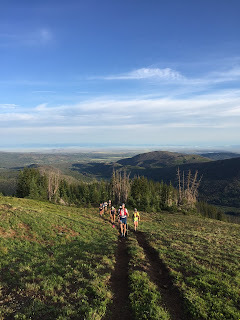 It eventually spilled out onto runnable fire road and I fell into a rhythm talking with another runner. 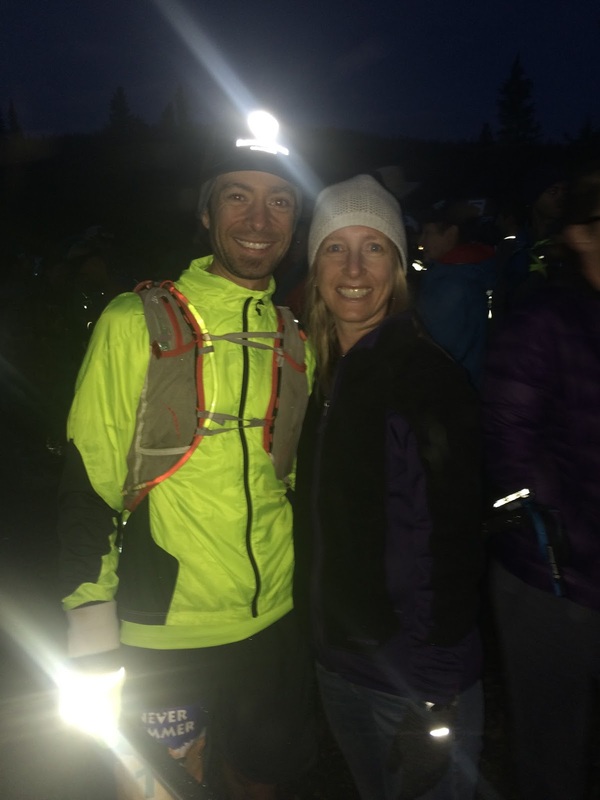 Coming into the Diamond Aid Station at mile 17, I was excited to see Julie and Andrew for the first time. I was still in great spirits and feeling good. We refilled my bladder of nutrition and I grabbed some more solid foods. I was eating really well early on in the race which was a good thing. I gave Julie a hug and headed out of the aid station. 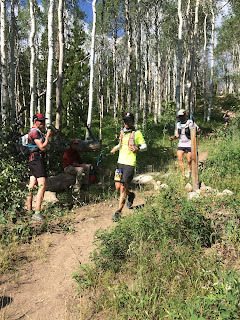 I headed up out of the aid station, ran briefly on the road and then made a right turn onto a jeep road that climbed up the mountain. Most of the road was runnable, but I chose to power hike the steeper parts to conserve energy. The jeep road eventually ended and that when things got comical. Pink flags shot up to the left onto a hillside that had no trail. You sort of ask yourself “seriously?” and think there is some sort of mistake until you look straight up the 50+ degree grade and see athletes struggling to make it up the hill. 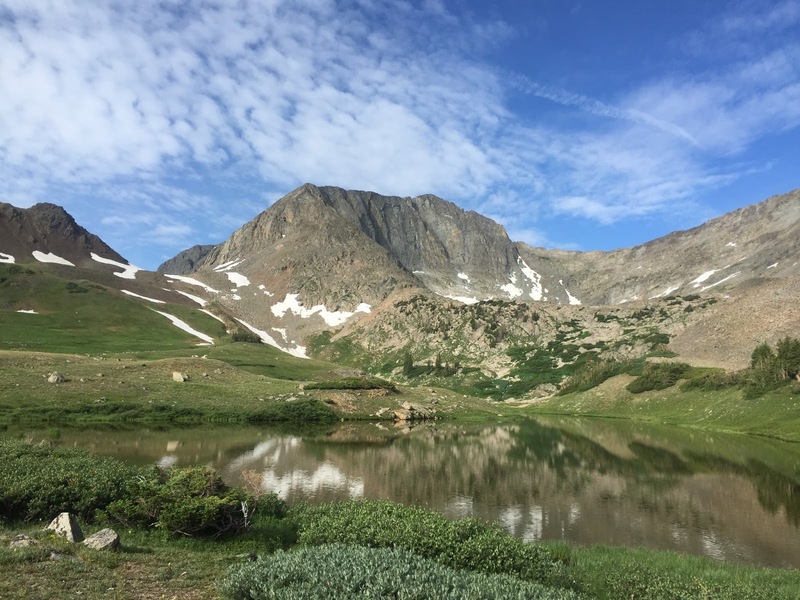 I dug my trekking poles into the hillside and pulled myself up one hard step at a time. This process would go on for almost an hour as I slogged my way up the 2,000+ foot 2.5 mile climb. There was no trail to follow, just a string of pink flags, vomiting athletes and people crawling on all fours to make it up. I just took it one step at a time and never stopped moving. All my vertical training paid off as I reached the summit with a huge smile on my face. There was even a band playing “Brown Eyed Girl” at the top of the mountain. Who knows how they got up, but I had one of the people take a photo of me at the summit. I was still feeling good and made my way north across the tundra blanketed ridgeline. 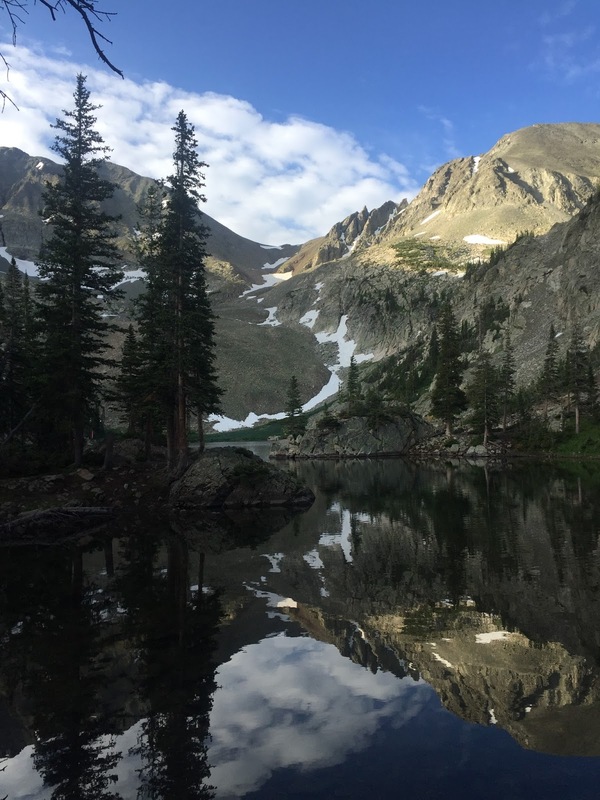 The scenery was mind blowing and I could not stop smiling. I felt like I was in some sort of fairytale book. We eventually dropped off the rolling summits and made our way into the valley below. I had about 6 miles before I saw Julie again and I just moved steady. This section was rolling and super difficult. There was a combination of bushwhacking, technical stream crossings and narrow single track to make it through. A grade that would otherwise be runnable, became a slog of jogging, hiking and bushwhacking. Once we made it out of the bush, I was happy to see Julie and Andrew again at Ruby Jewel Aid Station. 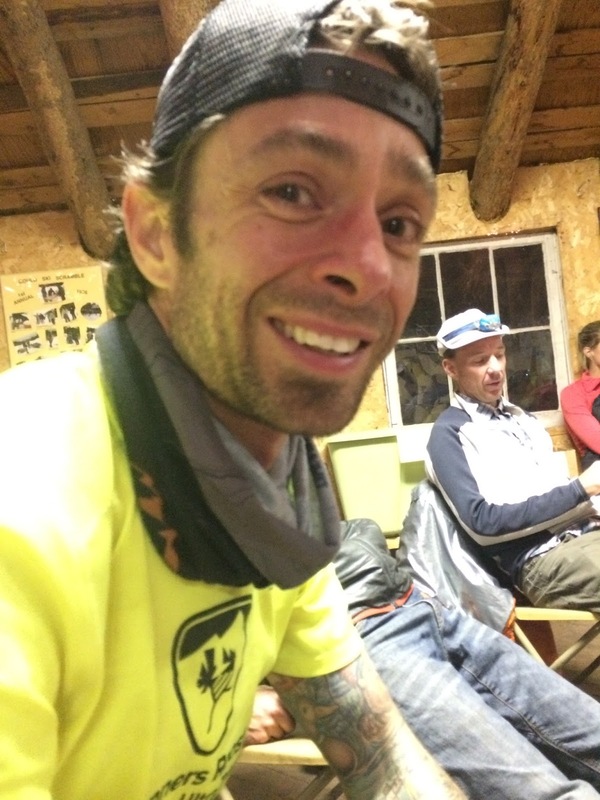 I was almost 30 miles in and while tired, I was still in good spirits. I refilled my hydration and grabbed some more food before heading out. The next 10 miles were a bit of a blur. 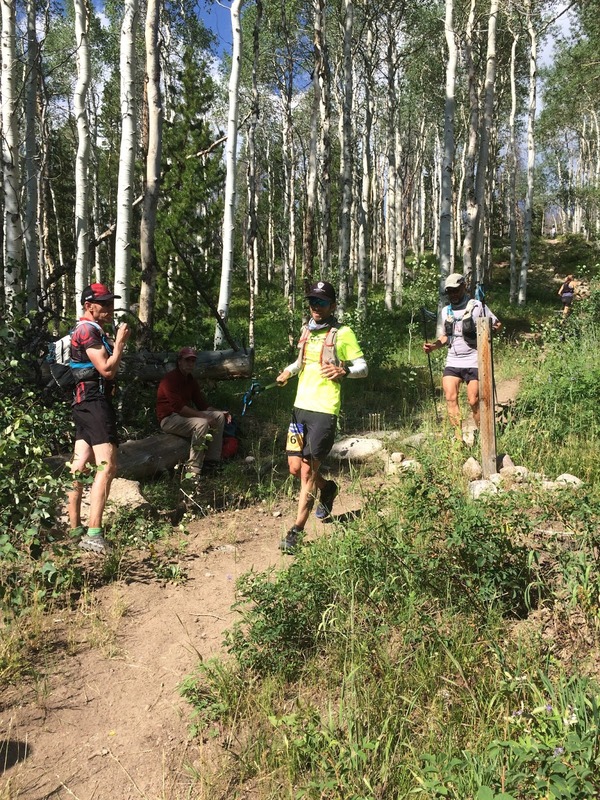 I joined up with a guy named Ryan from Steamboat and we pushed each other at a steady pace. It was nice to have another runner with me to keep me honest and moving. We made our way up a fairly gnarly climb that weaved its way through a lush stream carved hillside. Making our way down a class 3 boulder field, the trail continued on and became a little more runnable. We could see a mountain lake below us. 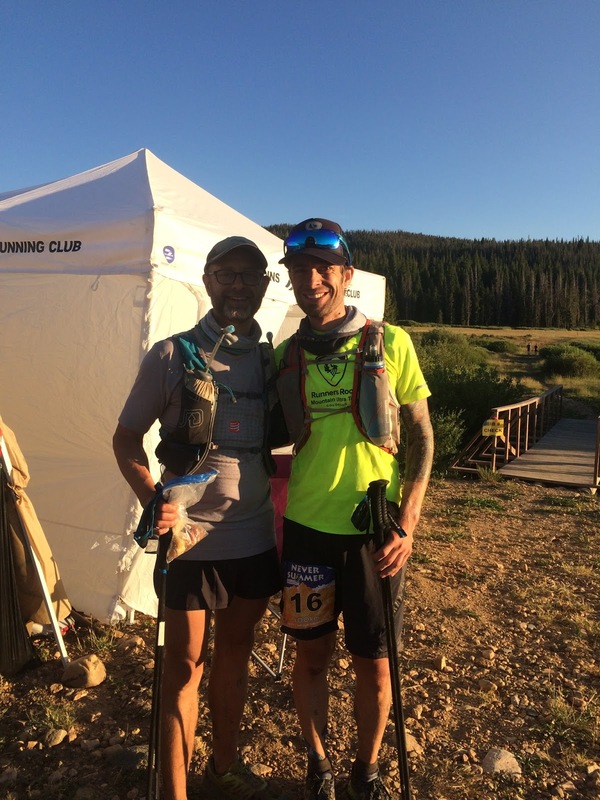 Ryan and I were still together and running well. We passed a small water aid station by the lake and then started to push pretty hard through the valley. 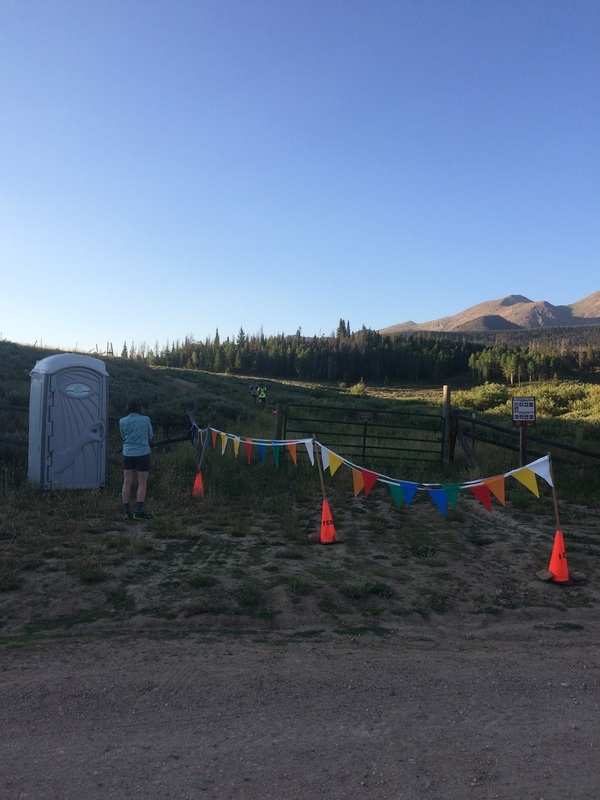 It was 6 miles to the Clear Lake aid station and I decided to run the whole way. I ran around a 9-10 minute mile pace this whole section. 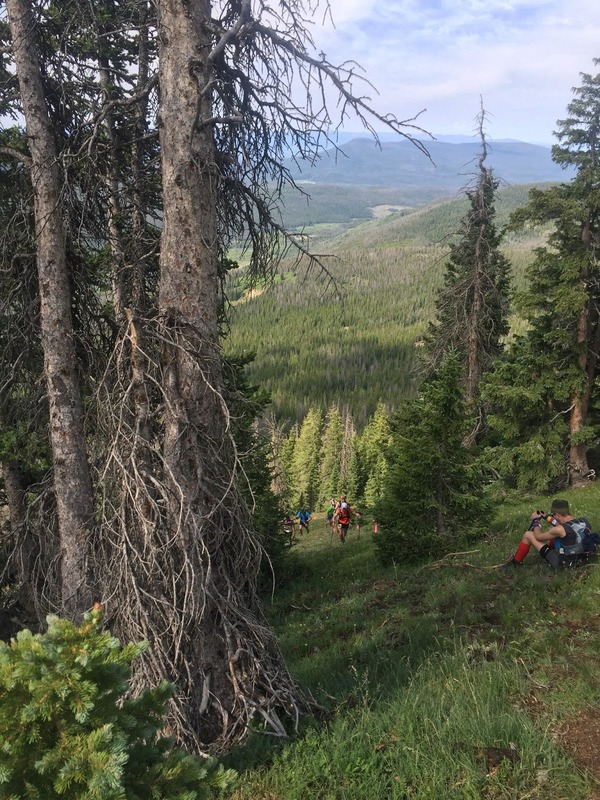 It was one of my favorites of the course with a slight downhill non-technical singletrack trail through fields of trees and wildflowers. I passed about 15 people through this stretch and came blazing into the Clear Lake aid station at mile 40 where I was anticipating Julie and Andrew who would be pacing me the remainder of the race. 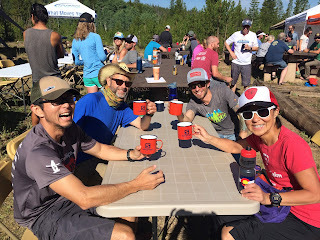 I got into the aid station and had beat both Julie and Andrew there. 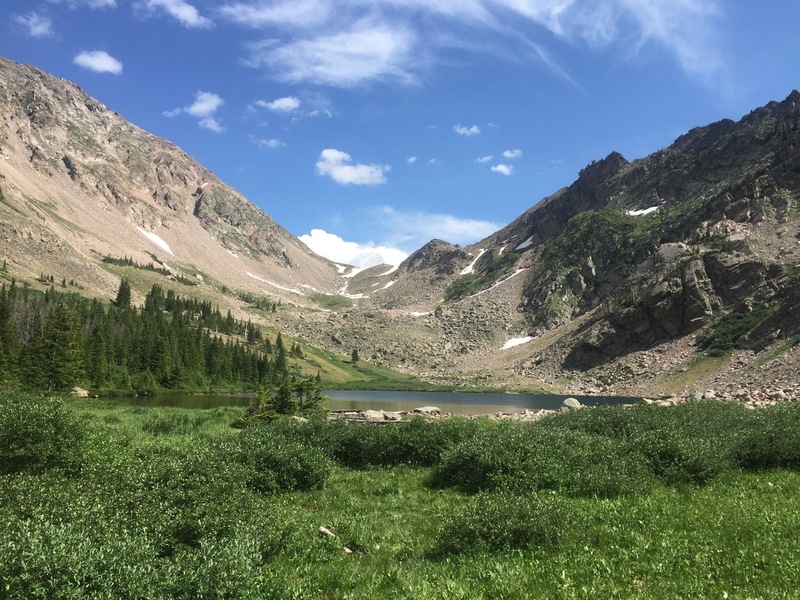 I was hot and thirsty from the last push and grabbed some fluid and food at the aid station and decided to make the solo push up the 1200 foot out-and-back climb to Clear Lake. For me, that’s when the race started to get hard. I could feel my heart acting up again, and I was out of breath. I could tell I was dehydrated and needed energy. Mentally I was struggling to make the push. Sweat was dripping down my face. I think I burned a little too much in the previous section but what was done was done. I needed to dig deep to finish the last 25 miles. I eventually made to Clear lake, stopped to take a photo and started to make my way back down. Soon after the turn I saw Andrew who had climbed up the trail to find me. I was so happy to have Andrew there. We ran Leadville together the previous year and he knew what I was going through. We made it back down to the Clear Lake aid station and Julie taped up my sore ankle and Andrew got me some potatoes and salt. It was the best ever. I was tired but knew it was time to get to work. Andrew and I blazed the short downhill and began to make our way through the valley and up the next hill. 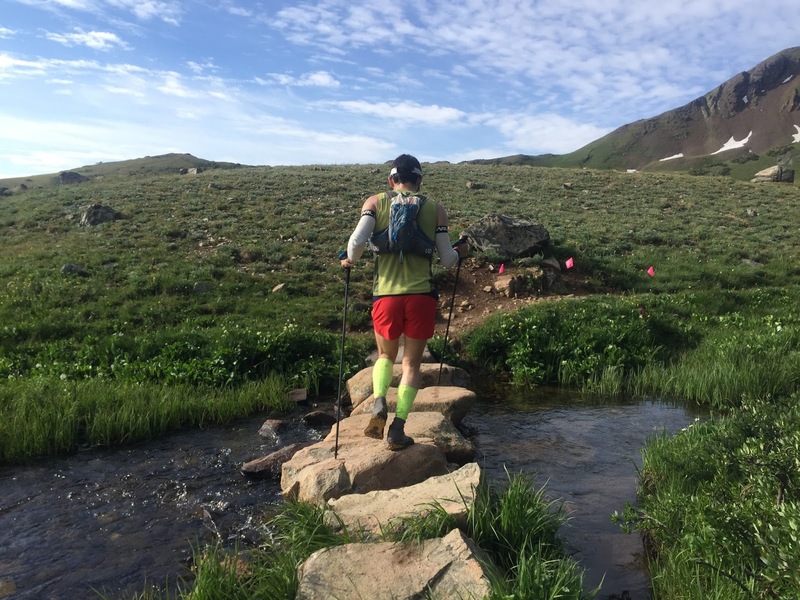 While this section was only 5 miles long, it felt like the longest section of the course for some reason. 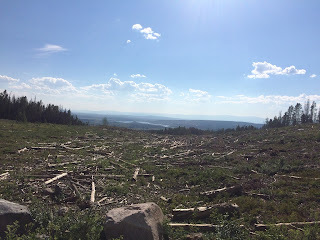 It was brutally hard running over cow pasture and uneven footing and seemed to go on forever. Not sure I was the best company during this section but I tried. 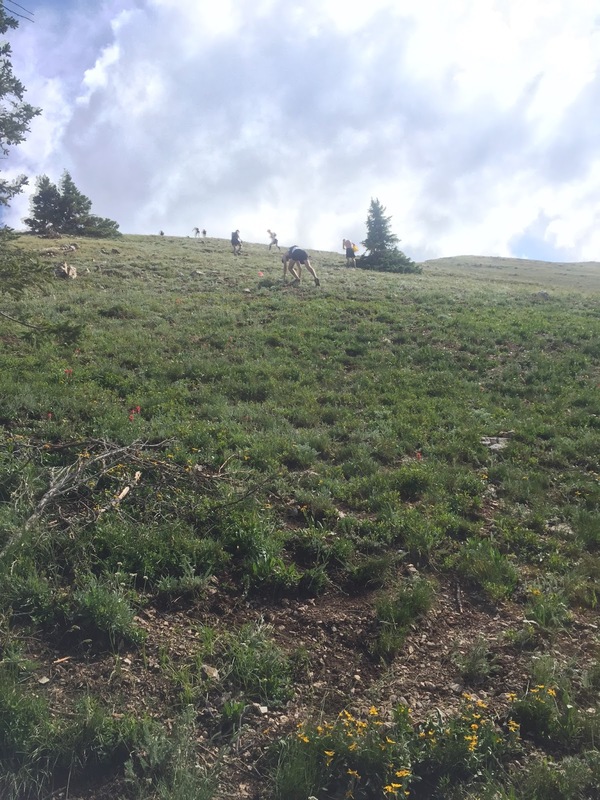 We saw a couple of people on the side of the trail puking and laying down in exhaustion. Making it to the Canadian Aid Station at mile 50, I grabbed some potatoes with Andrew and saw Julie again. 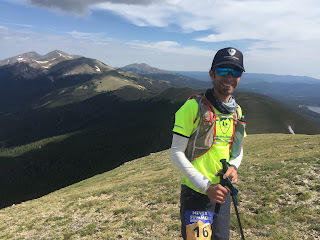 The race was getting hazy for me and I was wondering how I was going to make it the last 15. Sweat was pouring down my face and I couldn’t drink enough to replenish it. Everything hurt. “I feel like quitting” I told Julie. “Too bad” she said as she pushed me back on to the course. Somehow I was able to push out a couple miles of hard and steady running at this point. I kept moving until we got to the climb. Andrew made me eat and drink on somewhat regular intervals and we kept moving ahead into the woods. The landscape was still pretty but not as stunning as the first 40 miles. Mostly forest and meadows, but still pretty nonetheless. Before I knew it, we made it to Bockman Aid at mile 55 and saw Julie one last time before the finish. I was in better spirits at this point. The last 5 miles went by quickly and I knew I had it in me to finish the last 10 before midnight. It still was light out and I didn’t have much further to go. Andrew grabbed the world’s largest bag of potatoes at the aid station and handed it to me. I shoved as many in my mouth as humanly possible and began to move. 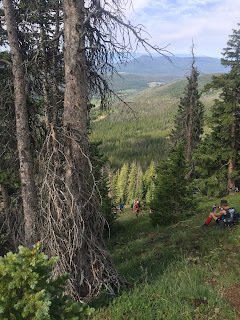 We had another 1000 feet of climbing left in the race. Heading out of the aid station, we ran out into the valley and eventually made our way to the world’s longest fire road. It was a little too steep to run, but not steep enough to walk slowly. We power hiked it as fast as possible. Ryan was up ahead of us about 100 yards or so. 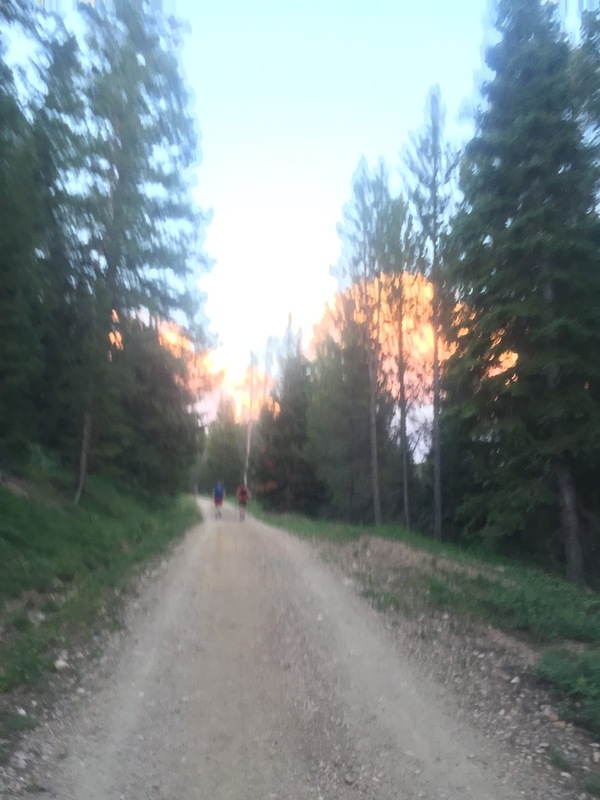 The sun began to set behind us and the trail eventually turned into the forest. The trees closed in around us and we turned on our headlamps. My legs were incredibly sore at this point and I had to stop and stretch every so often. We made our way in the blackness by the beams of our headlamps over roots, streams and rocks. What felt like an eternity later, the trail popped out onto a dirt fire road and we could see the lights of an aid station in the valley below. I ran as much as I could but my legs were all but gone and the downhill felt like fire in my quads. Andrew was patient with me though and made sure we kept moving. We eventually made it to the aid station. 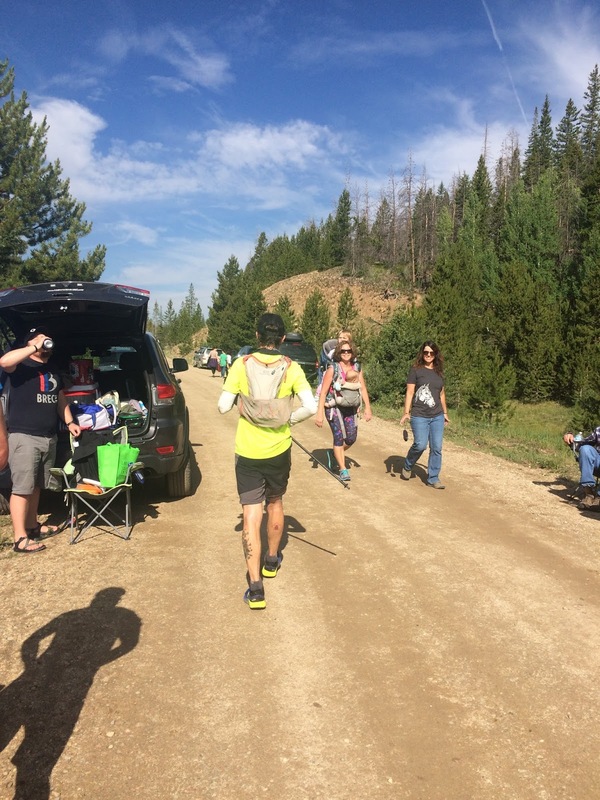 “2.2 miles to the finish and rolling downhill” the aid station volunteer told us. “Let’s go!” I said and then joked with the lady that downhill didn’t exist in this race. I asked Andrew what time it was. “Let’s finish this thing before 10!” I replied. We ran hard and steady the last stretch. It was rolling smooth trail that took us towards the finish line lights at the end of the road. Rounding the corner I hit the finish line at 9:47 PM for a finish time of 16:17. In typical Tim fashion I started crying in joy and exhaustion. I had beat my anticipated goal time by over 2 hours! Julie got me some food and water at the finish as I sat in the community center and recovered from the day. The race was beautiful, crazy hard and one that I will always remember. It was another tale of the mental battle we can all face and overcoming the odds. I feel so blessed to have been able to finish! 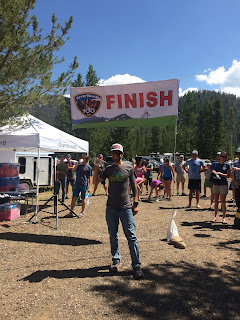 By finishing in under 23 hours I have another ticket to apply for the Western States Lottery next year. The streak is still alive. For now, I plan on enjoying the rest of my summer!